Certain job advertisements explicitly require applicants to be willing to work not only on a shifting schedule, but even during holidays. This is particularly true for those employed in business process outsourcing (BPOs) entities. Some workers, because of the nature of their occupations, will certainly be required to work this coming Christmas and Rizal Day (both of which are national holidays). Among these are mall salespersons, security guards, and tollgate operators. As a consolation of sorts, these workers are legally entitled to twice their regular pay for the first eight hours of service rendered. *Christmas Day this year falls on a Sunday, which means that for a vast majority of Filipinos, December 25, 2011 is already a rest day to begin with. However, I advice my readers (particularly those working in BPOs) to double check with their superiors this early if they will be made to report on that day. Always remember that since December 25 is a national holiday, the same rules apply for both regular or tenured and probationary (or a variation of these terms: non-permanent, contractual, and casual) employees. And it is always worth repeating this advice: don’t be absent on the work day immediately before December 25 (most likely December 23) since doing so would automatically strip you of your right to get a holiday premium even despite not reporting for work. 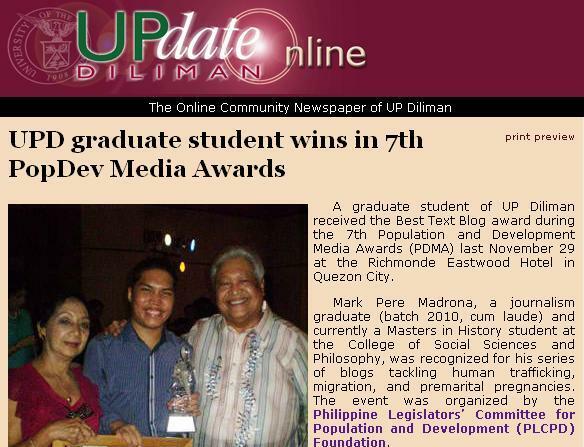 UPD.edu.ph has a story on my win at the 7th PopDev Media Awards! Let me continue relishing the winning moment! It feels like walking into the campus and seeing unexpectedly a huge streamer (or tarpaulin, if you like) congratulating me for a major feat. Needless to say, I am very elated to be featured in the website of my alma mater. My sincere thanks to Prof. Ruben D.F. Defeo of the UP Diliman Information Office. One mistake I made is that I forgot to include the link to my blog there. Sayang! Two weeks after the awarding ceremonies, write-ups about the said event are finally coming out. Though media outlets such as GMA Network, Newsbreak, and the Philippine Center for Investigative Journalism reported the event, their respective write-ups focused solely on themselves (which is hardly surprising). Move.PH is the only news outlet to report on the remarks made by Albay Rep. Edcel Lagman and former Health Sec. Esperanza Cabral during the award’s night. They also published the complete list of winners. Kudos to them! The other day, the website of the Philippine Center for Photojournalism published a press release from the Philippine Legislators’ Center for Population and Development (PLCPD) Foundation, the event organizer. Ironically, the PLCPD is yet to publish this write-up on their website.